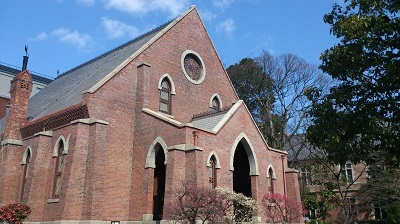 “Doshisha Chapel” As a brick building, this is the oldest protestant church in Japan. 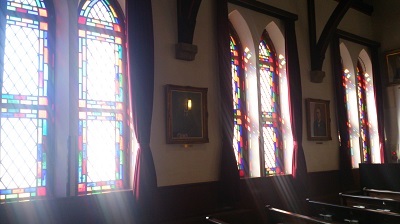 “Rays of sunlight in five colors” are streaming through the windows. 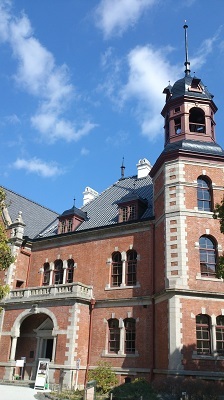 “Byron Clark Memorial Hall”; This building has been here since 1893 when Doshisha University was founded. 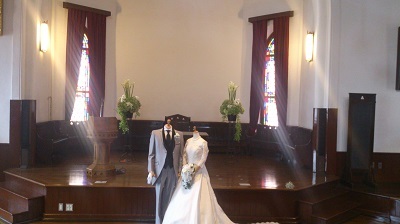 We held a “wedding consultation meeting” at the chapel and the Byron Clark Memorial Hall in Doshisha University today. It has been about five years since our first clients (who got married with this plan) had a wedding ceremony at the Byron Clark Memorial Hall. We had the record high number of the guests attended the consultation meeting today. Thanks for all those who came to the meeting today. Many guests were impressed by the historical buildings. 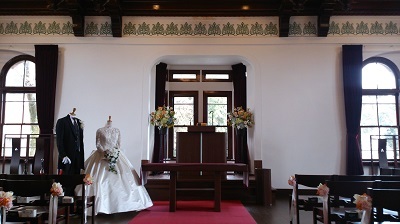 At Doshisha University, the wedding is performed in the authentic way with real religious service. As the ceremony is quite simple, it will make you notice what is important. I believe the ceremony will be an unforgettable event for the bride and gloom, and also for the guests who attend it.